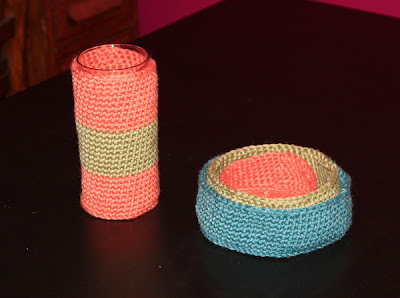 On New Year's Eve I exchanged gifts with The Cable Girl, who gave me some fantastic and fun gifts as always, including these colorful crocheted vessels in which to put stuff. Yay! I am a fan of cute things in which I can put crap so the clutter looks less untidy, so these will be very useful! Thanks so much, Cable Girl! 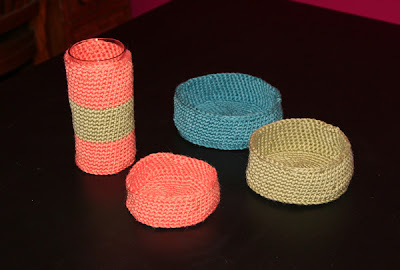 In all of my holiday excitement and New Year's Eve party preparations, I forgot to take pictures of the gifts I made for her, but she has posted them so go take a look. I sewed her a bag, made stitch markers out of polymer clay, and also a couple of polymer clay Christmas ornaments. What a fun and crafty way to end 2009!